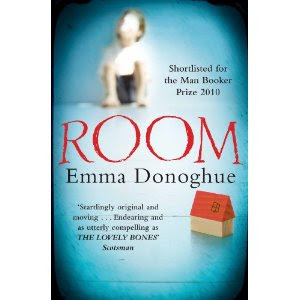 Told from the perspective of a five year old boy, Room by Emma Donoghue is a remarkably endearing tale of survival, mother-child love and life. Jack's mother was kidnapped by a man named 'Old Nick' and he kept her in a dungeon like soundproof room. Old Nick had created it in his garden shed. It is in this room, Jack was born and has grown up. He has never seen the world outside. To Jack, the 'Room' is like is his home, his world where he lives and plays with his Ma, but for his Ma, it is a prison in which she has been forced to spend seven long years of her life. Soon, after Jack's 5th birthday, she admits to him that there is a whole world beyond the walls of the room and comes up with a plan of rescue in which Jack has to play a huge role. Emma Donoghue has crafted such a heart wrenching tale that is truly riveting and spell binding. The characters of Jack and his Ma are so well crafted and real that it will pain your heart to find the kind of misery and pain they have undergone. Jack is intelligent, loves playing and reading, hates green beans and loves his mother dearly. That is why he finally agrees to help her mother in her plan of rescue despite being unsure if he could really do it. Jack's Ma is loving and caring, an epitome of love and compassion, but deep down tired of her life in the room. It is only because of Jack, she has survived the seven long years in the room and has kept the hope of living in the outside world again alive. I do not want to go into the details of the plot as I think it won't be possible to write about it without giving out spoilers. I was at first intimidated about reading this book as I had heard what the story was about and could not really imagine how could there be a story about a mother and a child living confined in a room. I am proved so wrong! It is a profound and beautifully crafted story that will take you on a journey of emotions - pain, misery, agony, love, exhilaration, joy and contentment. It will definately leave a indelible impression on the readers and will have a place in their memory for a long time. I found the story quite unsettling at some points. For a moment, I imagined myself in such a room and believe me, I had a feeling of suffocation. But, I loved the way it ended, there could not have been a better, profound and meaningful ending. I actually ended up not loving Room. I think I knew too much about the book beforehand to really appreciate it, if that makes sense. This book has been on my TBR for a long time now. Hi Jyoti, Good to be on ur blog. I actually came for the Blog Hop activity but when i saw that you also write Book Reviews, am stuck here :)Wonderful language, powerful words and nice flow. Love it here !! I have subscribed for your posts ..
Just popped over from your short stories review as I must have missed your review last year. What an incredible book this was I have just reviewed it myself!